Minicom's Classic Classnet Board Version solutions give you full computer classroom interaction in a special space saving, vandalism proof internal format. The system provides full interaction between the teacher and up to 99 students. 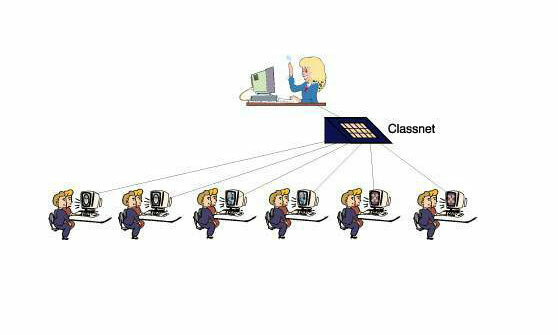 Classnet not only makes interaction possible, it also makes it constructive! Real-time, two-way computer dialogues enhance communication from instructor to student. Students feel less isolated, and find it easier to "keep up." Need your students' undivided attention? At the touch of a button, darken their screens and lock their terminals for classroom discussion. One more touch of a button and their screens and keyboards are returned, without losing any data. Most importantly, all of this can be accomplished from a single, user friendly, easy to operate command center. Classnet lets you demonstrate solutions directly onto students' screens. When a student encounters a problem and signals for assistance, you can take over his or her screen and keyboard, and then switch that student's screen to the entire class, or to any selected group of students. When problems persist, you can continue to tutor the student or group, while the others go on with their lesson. With Classnet, feedback is immediate and personal. Classes become more beneficial and enjoyable, clearly increasing everyone's level of satisfaction. Thanks to its scalability you buy only the exact number of BV units you need and can add more as you grow. This preserves your initial investment! In addition all power for the system is drawn directly from the computer so no external power supply is needed either. This eliminates the need for power outlets and further reduces cable clutter. The BV is an affordable solution with a wide range of functions that make it the ideal solution for schools, universities and other similar institutions with tight budgets.